What does it take to move through blocks in your creative projects? In yourself? The image of Ganesh holding his tusk will always stir my soul. He broke it off during a non-stop writing project, to keep his commitment to write even when his pen broke. 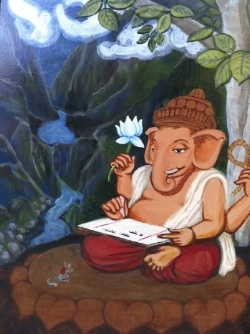 Ganesh and the sage Vyasa had a deal - as long as Vyas told his story, Ganesh would transcribe. This story is told in the Mahabharata, an ancient Indian epic. This was one of the first paintings I made while living at Shoshoni Yoga Ashram. It was incredible how many creative blocks - self-doubt, criticism, fear - showed up during the process! As the lord of obstacles, Ganesh embodies the energy of moving around and through blocks. A key thing here is MOVING - keep momentum in any form. In this and many of my paintings, there is flowing water in the background to indicate creative flow. I heard recently that when Einstein had a block in his scientific work, he would stop and play the violin. This strategy allowed him to create a flow in another outlet and then infuse it into his work. As a meditator, I find that blocks in my work are related to a block in myself. I am so lucky for my meditation training at Shoshoni that I know how to look within, take a conscious breath, and release the tensions in me that block my flow. How do you flow through your creative blocks?